Commonly referred to as IT, there are many job titles in the technology sector. From programming and database creation to providing general technical support, there are roles for people with many areas of interest, and many levels of expertise. The broad swath of jobs available means that employers look for different skills when hiring. Some may look for expertise in a specific language or program, while others might look for more general skills. For example, the ability to communicate clearly, the ability to manage complicated projects with varying milestones and deadlines, and the ability to manage budgets and the needs of peers in other departments. One of the basic skill sets an employer will look for in an IT professional is the ability to write code. If the job is programming, an employer may seek a candidate who can code in several different languages, as many systems are built using more than just one language. Writing code takes more than just proficiency with the coding language, it requires logical thinking, problem-solving, integrating different technologies, and having a broad understanding of information systems. Even for jobs that are not specifically code-writing, an IT professional should have at least a working knowledge of the more basic coding languages like HTML and C++. An IT professional should also have an understanding of the process of code-writing, in order to see a software development project through and to manage things like QA (quality assurance). It’s a commonly held belief in the industry that IT professionals can exist comfortably as introverts, but this is a misconception. 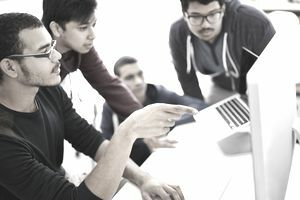 Communication skills are paramount for anyone in IT, as information technology professionals are often required to work across many teams and groups. IT professionals often have to provide tech solutions for people who aren’t as savvy. They have to demonstrate leadership at all levels of projects, and with many different groups. They’re often called on to present ideas and reports in larger groups of people. Part of an IT professional’s job will be to build teams and foster teamwork and collaboration among their peers. Knowledge networking is something that will be required of most IT professionals, in companies both large and small. Knowledge networking is an extension of good communication skills, as it requires gathering groups of people in a working environment to share what they know, in order to build a system of knowledge within an organization that is more than the sum of its parts. Knowledge networks require individual IT professionals to be open with their knowledge and to be open and curious about learning new things from their colleagues. On the other side of “networks,” some IT jobs may include network architects, engineers, and systems administrators. Network administrators (or systems administrators) are responsible for the day-to-day operations of a larger system. Many IT professionals will need to be self-directed and self-motivated, and a big part of self-directed work means an ability to manage time well. Technology work can often take longer than anticipated, as proven by how often timelines and milestones change over the course of a long project. An IT professional should be able to accurately assess how long a project should take, and then be able to stick to those timelines. He or she should also be able to help an entire team manage their time, on a daily, weekly, monthly, and project basis. The following technology skills list is perfect for use in resumes, cover letters, job applications, and interviews. Including these skills as keywords on your resume and cover letter, will enable employers to make a match when reviewing resumes and cover letters. Required skills will vary based on the job for which you're applying, so also review our lists of skills listed by job and type of skill. The world has no shortage of need for information technology professionals. Almost every traditional analog or brick-and-mortar business now has a need for IT-focused employees, and that’s to say nothing of all the tech-based jobs around the world. Identify which skills you have: Sometimes, candidates take their skills and abilities for granted. When you have been doing a task or have had a certain bit of knowledge for a while, it can seem unexciting. For an employer, though, your personal mix of skills – including the ones you take for granted – could make you the perfect candidate. That is, if an employer is looking to upgrade documentation, then of two candidates with the necessary coding experience, the candidate who also mentions technical writing abilities will stand out and have an edge. Go through this list and identify all the skills you have. Identify which skills employers need: As you review the list above, what might stand out most is skills you need to get a job, but you’re currently lacking. If there is a skill on this list that you often see mentioned in job postings, consider taking a class or finding a way to gain experience in the area. Emphasize skills in your application: Your cover letter and resume are places to showcase your skills. You'll also want to highlight your skills during interviews as well. Keep these skills in mind when you are reviewing job advertisements – think about how the position's requirements match up to these skills.